The film Back to the Future is one of my son's favorite films—I have great memories for them too and still have memories of how blown away I was when I first saw the film at its opening release. 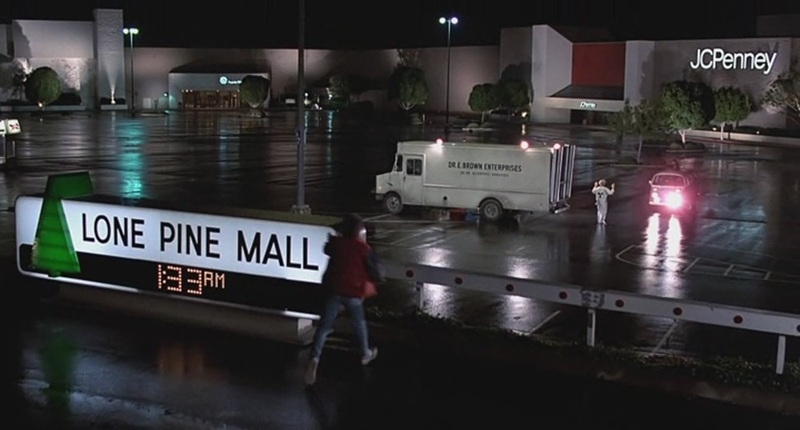 I've long known that the location of the fictional Twin Pines Mall in the film was Puente Hills Mall in the City of Industry/Rowland Heights area of the San Gabriel Valley in Southern California. I have family who live only an exit away and when I was attending UCLA n the 1980s, I would occasionally visit them and sometimes visit the mall, sometimes taking my younger cousins as company. That opportunity came up near the end of February for a family party (in fact, it was coincidentally my birthday as well). I wanted to be sure, however, that the display was still there, and after finding no mention of it online or at the mall's website, I called the mall directly. Fortunately, the person at the information desk there was not only able to confirm the display was still there but also its location. I also had the presence of mind to find out where the exterior scenes—featuring the Libyan terrorists—were filmed. In the film (see the screencap accompanying this post), you could clearly see a JC Penney in the background. It turns out that JC Penney closed years ago and was replaced by a 24-Hour Fitness Center. We parked next to the fitness center and before going into the mall, took a walk to get a good vantage shot of where the exterior shots were filmed. You'll see we were right there, though we took our photos a little bit to one side of the film shot. In the photos, you can see the service road both in the screencap and our photos—it actually was a fairly busy thoroughfare, such that it was impossible to safely take a photo standing in the middle of the street. At one point, a car full of young people stopped and asked if we were taking photos because of the film—when I confirmed we were, they laughed and said, "We were just talking about it!" They thanked me when I told them about the sign inside the mall. The sign itself is clearly displayed though I saw no explicit reference to Back the Future. Anyway, it was a fun detour on this trip!